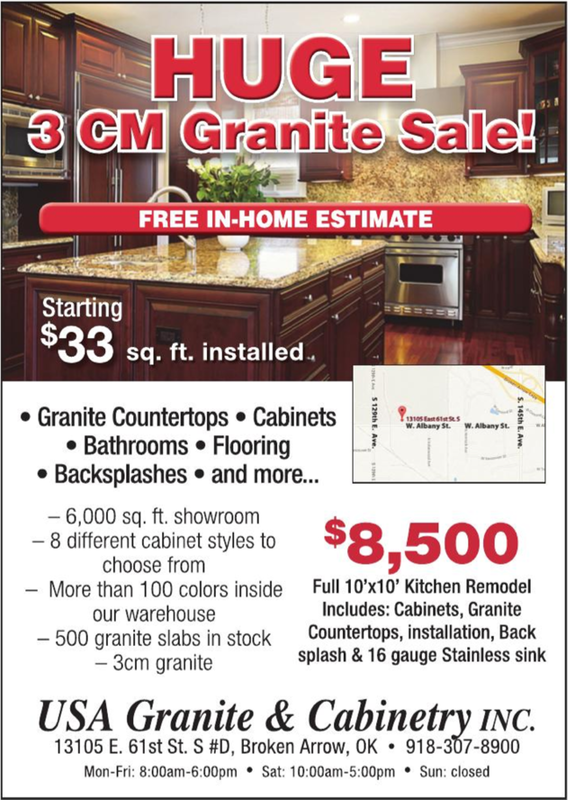 Check Out Our $8,500 Kitchen Special! Details on our Promotions Page. We wanted to say thank you very much for the quality job you did in installing the granite in our kitchen and back splash. You and your crew did an excellent, meticulous job. Our kitchen looks great! — Pete & Libby M.
Our team consists of professionals with over 30 years of combined industry experience. Our installers have been in the renovations business for over 10 years. Our master fabricators are highly sought after professionals with a reputation for excellence. These highly-skilled fabricators will sculpt, prepare, and treat your granite to the exact specifications for your satisfaction. USA Granite & Cabinetry Inc. is your local source for granite counter tops and cabinetry for your home or business in the Tulsa Metro area. Copyright ©2019 USA Granite and Cabinetry. All Rights Reserved.